While protected bike lanes are being adopted by many American cities, in some places local officials still contend that these street redesigns are just too difficult to implement. 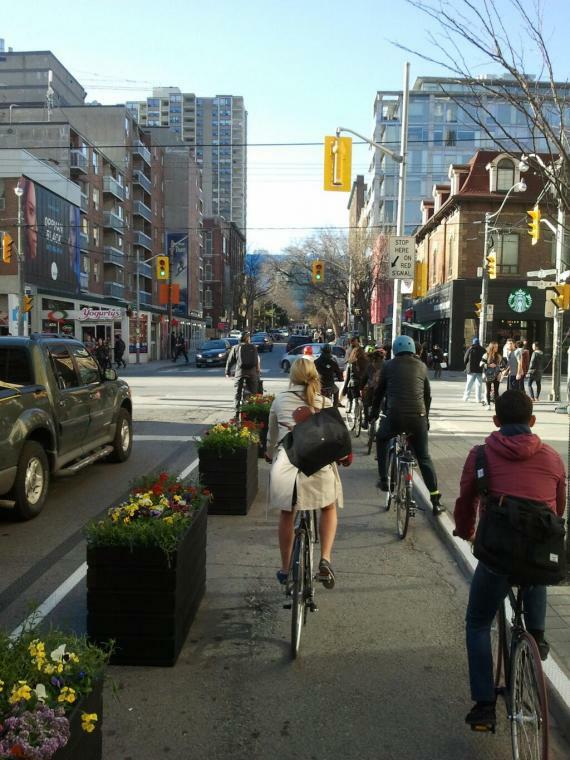 But how hard is it to set aside street space where people feel comfortable biking? Max snapped this photo one morning a few weeks ago at John and Queen, looking north. I was completely flabbergasted at first. As many of my readers might now, there was a long extended fight with Councillor Vaughan and a bunch of planners who were trying to plan cyclists out of the picture and create a pedestrian arcade (but with cars) out of John Street. This seemed like a complete 180, where cyclists were actually given their own space instead of treated like pariahs. But, no, it was not to be. 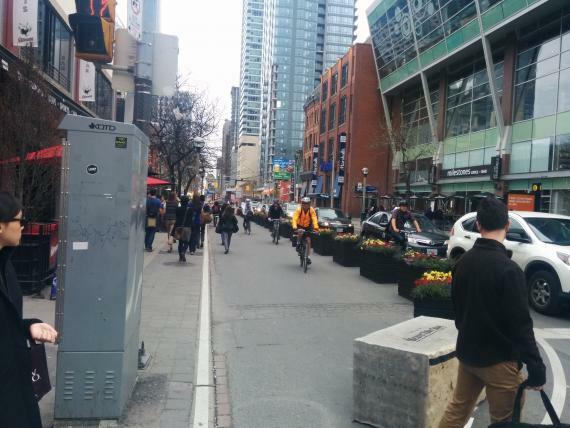 Instead this is a pilot project until October to carve out a much larger pedestrian zone with a row of planters. Instead of being a protected bike lane much like I’ve seen in Vancouver, it’s a “pedestrian” zone. Cyclists don’t know what to do with the space. Some people are still using it as a bike lane while other cyclists choose to squeeze next to a multi-block long line of cars (photo by Michal). Herb is disappointed the city didn’t include protected bike lanes in the street reconfiguration. Will the final design discourage cycling, or will it be flexible like the temporary project? Elsewhere on the Network today: Systemic Failure scoffs at the news that a Hawaii father has been convicted of child endangerment for making his son walk a mile home from school. Bike Portland considers the significance of the fact that “America’s bike capital” has no elected officials who commute by bike. And ATL Urbanist shares some photos showing how parking devoured Atlanta’s walkable urban fabric in the 20th century.